I couldn’t find what I was looking for, so I made my own! They are made out of 15 foot of paracord. I dyed it with rit dye mixed with boiling vinegar, 1:1. I made a loose wrapping and tied it with some string, then dipped each side in dye for about 5 min per side. Then I dried them in the dryer after rinsing them well. I cut them in half and melted the ends, then laced them in a “spider-web” lacing design. The lacing design is from this site. That’s an awesome site about laces and lacing. The whole project took me less then half an hour and I was able to do exactly what I wanted with my laces. 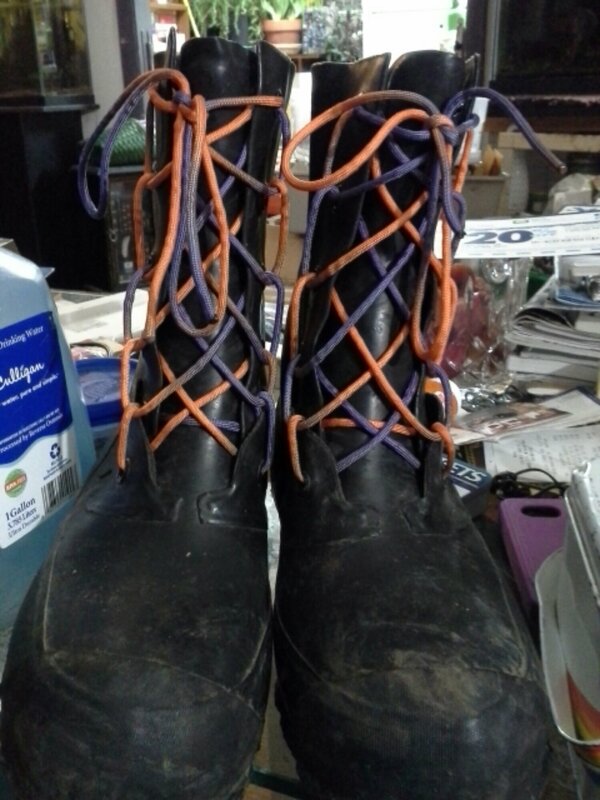 I was getting tired of black boots with boring black laces, now I have awesome laces! Dosn’t everybody need awesomeness in their life?